Combine all the marinade ingredients in a bowl, add the cubes of tofu and leave for a few hours in the fridge or overnight. Place the marinated tofu onto a pre-heated grill and cook for 2 - 3 minutes until golden brown. Remove & set aside. Place the carrot & courgette strips, pak choi and onion onto the hot grill and wilt down for around 30 seconds - 1 minute. 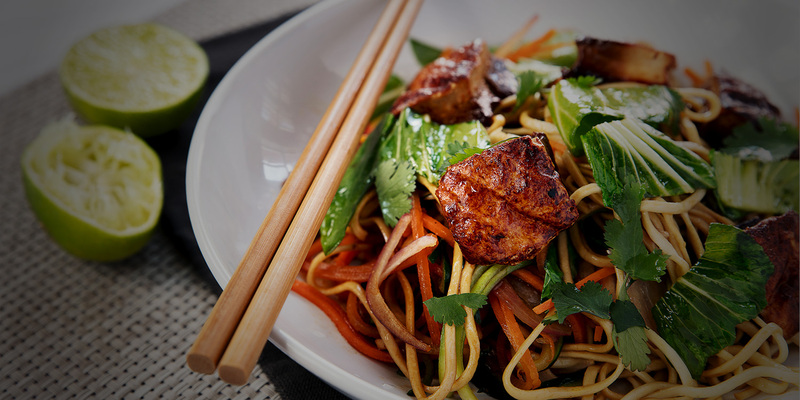 On a serving dish, place the cooked warm noodles, top with the wilted vegetables and the grilled tofu. Scatter with the torn fresh coriander leaves & a squeeze of lime juice to serve.